The Conciergerie is a building in Paris, France, located on the west of the Île de la Cité ("Island of the City"), formerly a prison but presently used mostly for law courts. 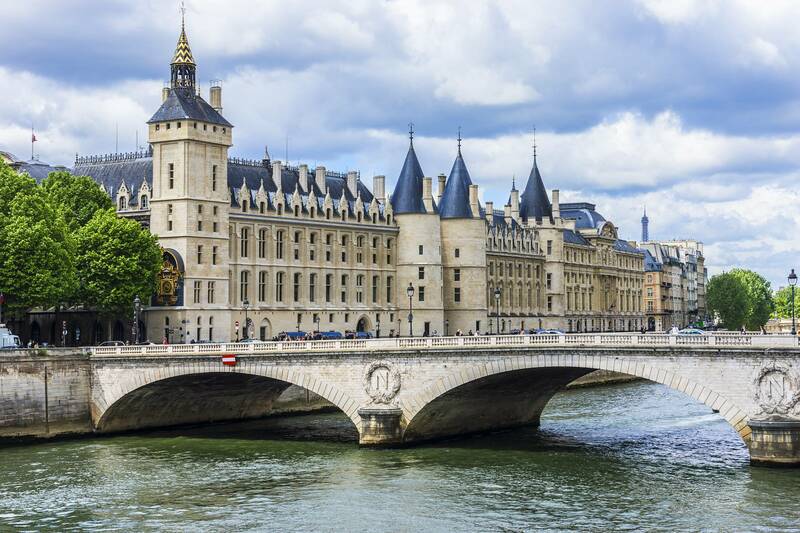 It was part of the former royal palace, the Palais de la Cité, which consisted of the Conciergerie, Palais de Justice and the Sainte-Chapelle. Hundreds of prisoners during the French Revolution were taken from the Conciergerie to be executed by guillotine at a number of locations around Paris. The west part of the island was originally the site of a Merovingian palace, and was known initially as the Palais de la Cité. From the 10th to the 14th centuries, it was the main palace of the medieval Kings of France. During the reigns of Louis IX (Saint Louis) (1214–1270) and Philippe IV (Philip the Fair) (1284–1314) the Merovingian palace was extended and fortified more extensively. Louis IX added the Sainte-Chapelle and associated galleries, while Philippe IV created the towered facade on the Seine river side and a large hall. Both are excellent examples of French religious and secular architecture of the period. The Sainte-Chapelle was built in the French royal style to house the crown of thorns that was brought back from the Crusades and to serve as a royal chapel. The "Grande Salle" (Great Hall) was one of the largest in Europe, and its lower story, known as "La Salle des Gens d'Armes" (The Hall of the Soldiers) survives at 64m long, 27.5m wide and 8.5m high. It was used as a dining room for the 2,000 staff members who worked in the palace. It was heated with four large fireplaces and lit by many windows, now blocked. It was also used for royal banquets and judicial proceedings. The neighboring Salle des Gardes was used as an antechamber to the Great Hall immediately above, where the king held his lit de justice (a session of parliament in the king's presence). The early Valois kings continued to modify the palace during the 14th century, but Charles V abandoned the palace during 1358, relocating across the river to the Louvre Palace. The palace continued to serve an administrative function and still included the chancellery and French Parliament. In the king's absence, he appointed a concierge to command of the palace, a fact which gave the palace its eventual name. During 1391, part of the building was converted for use as a prison and took its name from the ruling office. Its prisoners were a mixture of common criminals and political prisoners. In common with other prisons of the time, the treatment of prisoners was dependent on their wealth, status and associates. Wealthy or influential prisoners usually got their own cells with a bed, desk and materials for reading and writing. Less-well-off prisoners could afford to pay for simply furnished cells known as pistoles, which would be equipped with a rough bed and perhaps a table. The poorest, known as the pailleux from the paille (hay) that they slept on, would be confined to dark, damp, vermin-infested cells known as oubliettes (literally "forgotten places"). In keeping with the name, they were left to live or die in conditions that were ideal for the plague and other infectious diseases, which were rife in the unsanitary conditions of the prison. Three towers survive from the medieval Conciergerie: the Caesar Tower, named in honor of the Roman Emperors; the Silver Tower, named for its alleged use as the store for the royal treasure; and the Bonbec ("good beak") Tower, named for the torture chamber that it housed, in which victims were encouraged to "sing". The building was extended during the reigns of later kings with France's first public clock being installed about 1370. The current clock dates from 1535. The ten month Reign of Terror (September 1793-July 1794) had a profound effect on France. More than 40,000 people died from execution and imprisonment, and France would not be a republic again for nearly half a century. The Conciergerie prison became the main penitentiary of a network of prisons throughout Paris, and was the last place of housing for more than 2,700 people, who were summarily executed by guillotine. The dank dungeons were a stark contrast to the beautiful architecture of the palace above. The quality of life of the prisoners was based mainly on their personal wealth and the whims of the jailers. The revolutionary period continued the prison's tradition of interning prisoners based on wealth, such that wealthier prisoners could rent a bed for 27 livres 12 sous for the first month, 22 livres 10 sous for subsequent months. Even when the price was decreased to 15 livres, the commanders of the prison made a fortune: as the Terror escalated, a prisoner could pay for a bed and be executed a few days later, freeing the bed for a new inmate who would then pay as well. 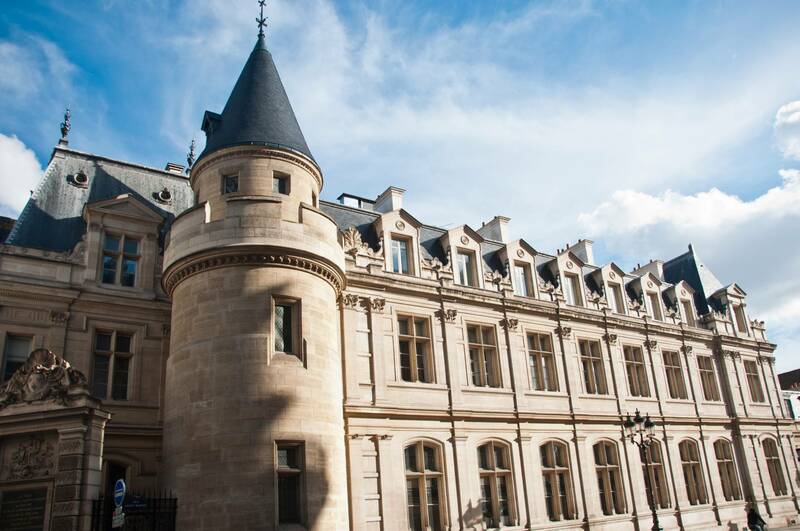 One memoirist termed the Conciergerie "the most lucrative furnished lodgings in Paris". Only celebrity prisoners were assigned cells to themselves. Most of the pistole inmates were stuffed into a single room that abutted a local hospital, making disease an inevitability. The cramped cells were infested with rats, and the stench of urine permeated every room. All the prisoners, except those locked in the dungeons, were allowed to walk about the prisoners' gallery from 8 a.m. to an hour before sunset. Roll call was always a tortuous proceeding because many of the jailers were illiterate and it could take hours for them to confirm that all of the prisoners were accounted for. A principal jailer, who sat by the door, determined whether visitors would be allowed inside the prison. His decision depended more on his mood than any set proceedings. He was also in charge of resolving disputes between jailers and their charges. Trials and executions progressed in a rapid, unpredictable manner; one could be tried by the court and executed before the next morning. The condemned would be walked through the Salle de la Toilette, where their personal belongings were confiscated. Carts loaded them in the May Courtyard and brought them to guillotines throughout Paris. Prisoners held at the Conciergerie included Marie Antoinette, poet André Chénier, Charlotte Corday, Madame Élisabeth, Madame du Barry and the 21 Girondins, purged at the beginning of the Terror. Georges Danton later awaited his execution here, and, during the Thermidorian Reaction, Robespierre himself was interned for a brief time before his execution. The Conciergerie was decommissioned during 1914 and opened to the public as a national historical monument. It is presently a popular tourist attraction, although only a relatively small part of the building is open to public access; much of it is still used for the Paris law courts. It has been listed since 1862 as a monument historique by the French Ministry of Culture.